Philip Pearlstein, Female Model on Eames Stool, 1978; oil on canvas, 48 x 60 in. 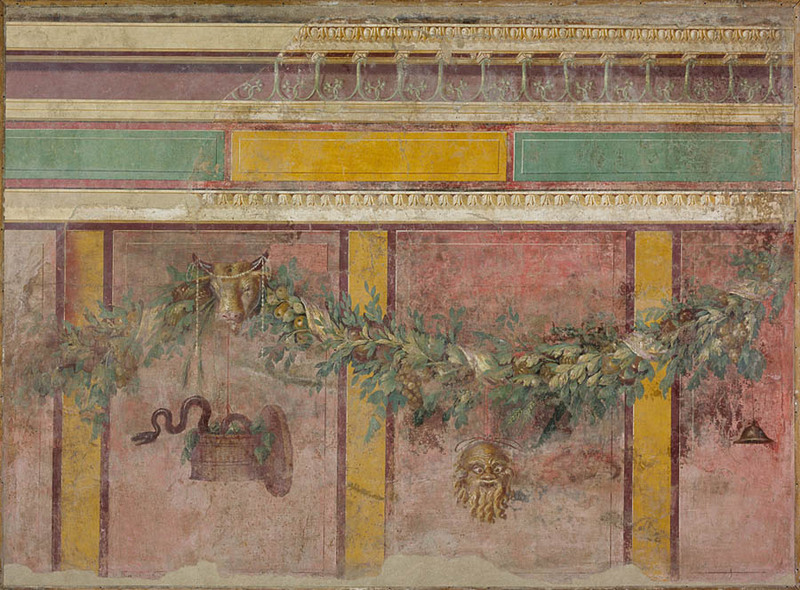 See a high resolution image on the Metropolitan Museum of Art website. The Old Masters had sensed that it was necessary to preserve what is called the integrity of the picture plane: that is, to signify the enduring presence of flatness underneath and above the most vivid illusion of three dimensional space. The apparent contradiction involved was essential to the success of their art, as it is indeed to the success of all pictorial art. The Modernists have neither avoided nor resolved this contradiction; rather, they have reversed its terms. One is made aware of the flatness of their pictures before, instead of after, being made aware of what the flatness contains. Photographs do not break the picture plane, and so they parallel one of the great dictums of 20th century modernist art, which is that form follows function. The paper is flat, that is, the picture plane is flat, therefore the artist must keep his picture flat. Therefore the photograph is accepted as modernist art. Therefore one of my aims in painting is to break the picture plane. In the Pearlstein painting above, that knee juts out and pops through the picture plane. A version of an oft-told ancient Greek story concerns a contest between two renowned painters. Zeuxis produced a still life painting so convincing that the birds flew down to peck at the painted grapes. 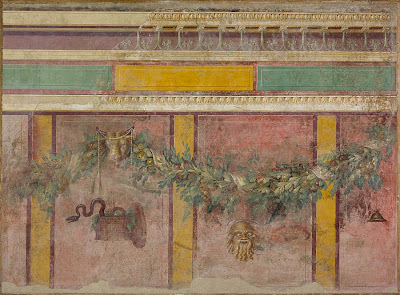 A rival, Parrhasius, asked Zeuxis to judge one of his paintings that was behind a pair of tattered curtains in his study. Parrhasius asked Zeuxis to pull back the curtains, but when Zeuxis tried, he could not, as the curtains were Parrhasius's painting––making Parrhasius the winner. Franceco di Girogio Martini, Studiolo from the Ducal Palace in Gubbio, 1478-82; See a high resolution image on the Metropolitan Museum of Art website, plus more views. 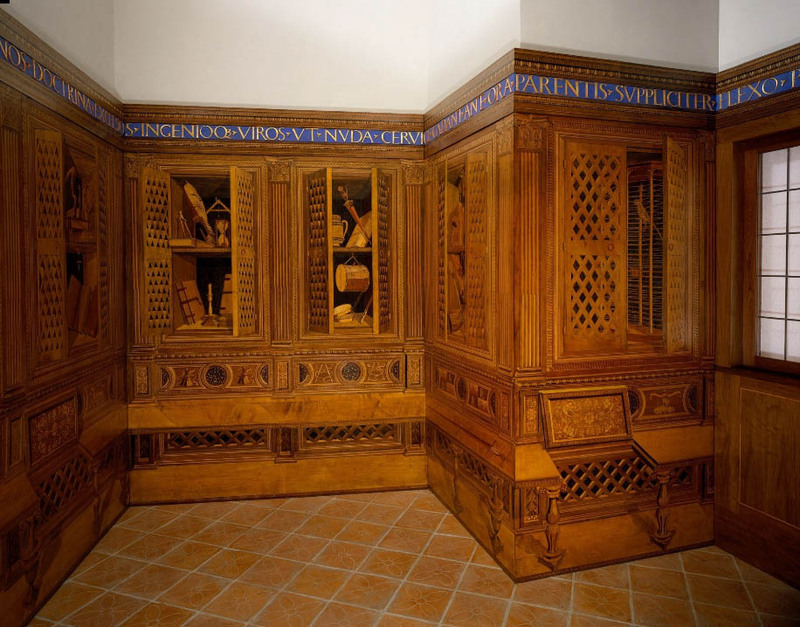 A truly marvelous work in this genre is this room which you can see at the Met. Its illusions are uncannily convincing and the workmanship superb. It is made of finely inlaid woods: walnut, beech, rosewood, oak and fruitwoods. 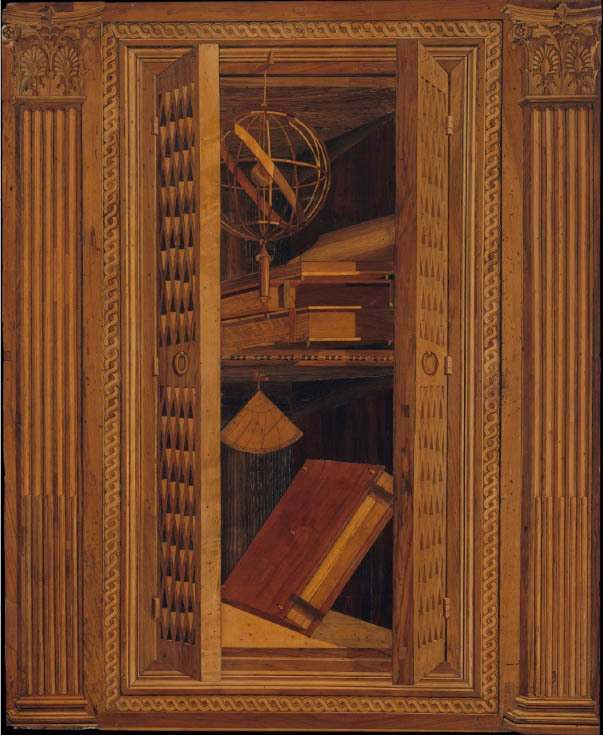 The objects that you can see through the "open doors" reflect the inquiring mind of Duke Federico. 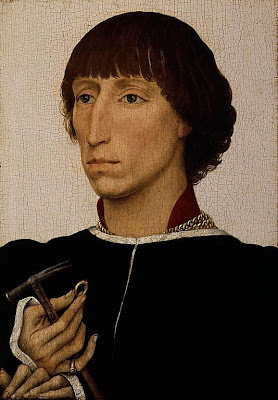 Some old masters consciously brought our attention to the picture plane by placing an object or a hand at its edge, as in this van der Weyden portrait. The hand rests on a ledge which is equivalent to the lower edge of the painting, making the two hands seem physically present in our space. Frans Hals, Petrus Scriverius, 1626; oil on wood, 8 3/4 x 6 1/2 in. ; See a high resolution image on the Metropolitan Museum of Art website. 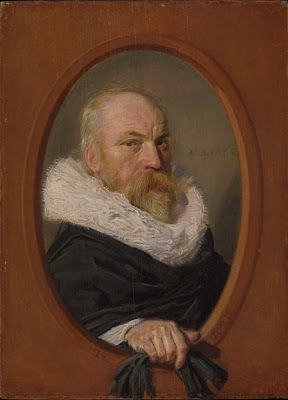 Frans Hals pushes the idea a little farther as hand and glove emerge from the portrait's frame. If we think of the picture plane as being continuous with the frame, the hand certainly breaks that plane. Juan Sanchez Cotan, Cardoon and Parsnips, ca. 1604; oil on canvas, 24 13/16 x 33 7/16 in. 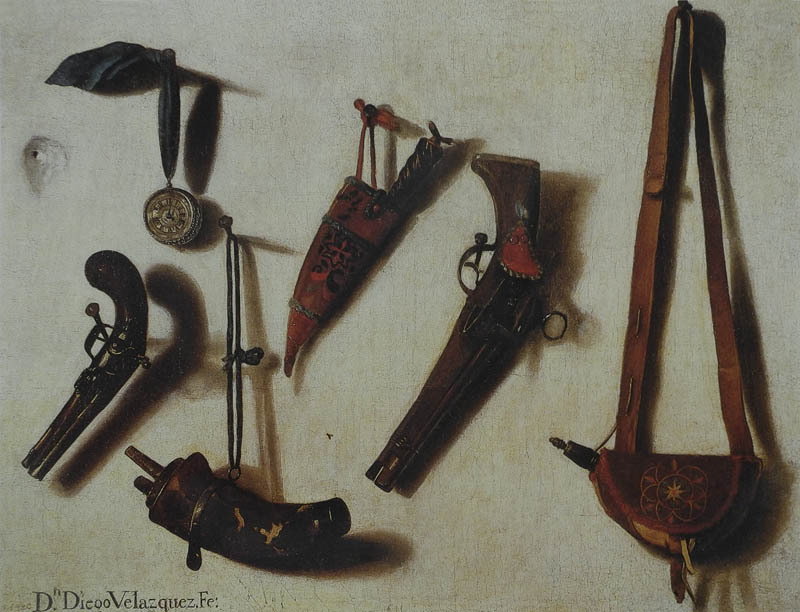 Many still lives, such as this by Sanchez Cotan, have objects protrude past a frame or a table, calling attention to painting's magical illusions. 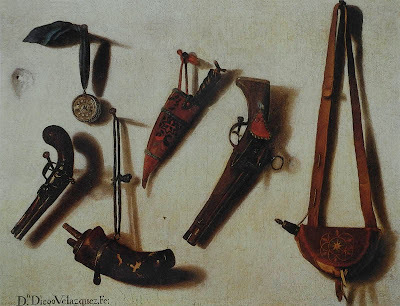 Some of the most effective trompe l'oeil paintings depict objects hung on a wall, a shallow space more easily portrayed as an illusion. Charles Wilson Peale, Staircase Group, 1795; oil on canvas, 89 1/2 x 39 3/8 in. High resolution image at Google Art Project. 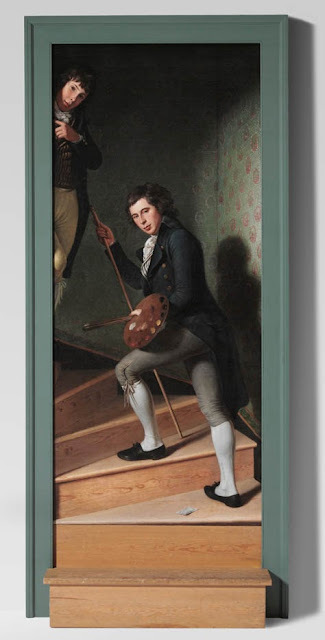 In the United States there was a lot interest in the notion of illusion on a flat surface, which Peale enhanced by adding an actual wood frame surrounding the canvas, with one actual wooden step on the floor. This is a very witty commentary on flatness and illusion. 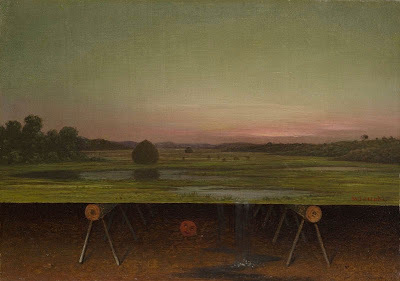 Martin Johnson Heade, Gremlin in the Studio, ca. 1865-75; oil on canvas, 10 1/8 x 14 1/4 in. Collection of the Wadsworth Atheneum. Humor intensifies in this landscape by Heade. A flat little creature under a canvas propped up on saw horses seems to have managed to open the bottom edge of the painting in order to allow the pond water to escape....naughty fellow! 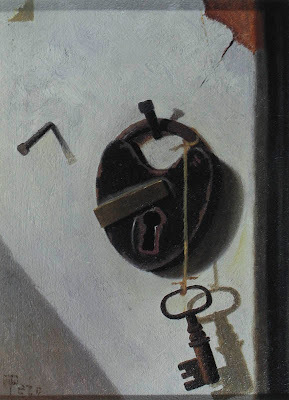 John Peto, Lock and Key, 1890s; oil on academy board, 8 x 6 in. 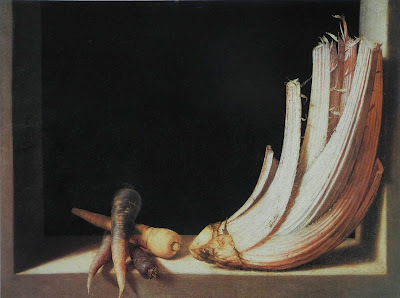 Trompe l'oeil was very popular in the 19th century and William Harnett was probably its most famous practitioner, but for me John Peto is a much superior artist. I go back to Clement Greenberg's quote above to explain why: Peto is always aware of the paint and of the flat plane that he's working on, while with Harnett's paintings I see a total immersion in illusionism so that detail overwhelms the sense of a whole. John Peto, Toms River, 1905; oil on canvas, 20 x 16 in. The tangibility of Peto's paintings comes from a tender love of their objects so strong that I feel a yearning towards them, a desire to touch, and to understand their quiet emotional power. I believe that nostalgia is part of the mix, that longing for the lost past, but of greatest importance, Peto makes us aware of the beauty of ordinary things, and of their value. We will be hosting a trompe l'Oeil juried art show at the Peto Studio Museum this fall. We are located in NJ. If you find yourself in the neighborhood, please stop by. Trompe l'oeil continues to fascinate, doesn't it? I won't be anywhere near the museum, but have a great show! Love your blog Altoon -- art and gardening -- bliss. Also find your book The Luminous Brush invaluable for my fine art course in materials and methods. Would love to own a paper copy but the price is prohibitive especially for a student. So thank you very much for making it available online. Thanks so much, Anita. And I'm glad the online version of Luminous Brush has been helpful. 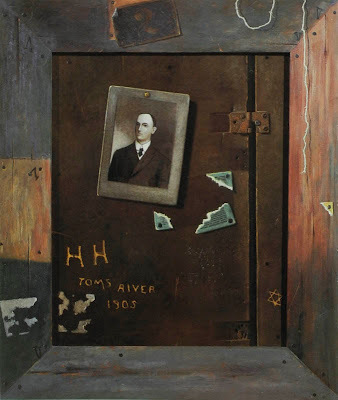 Thank you for connecting the dots from modernism to trompe l'oeil! This is a very good example of how modernism informs realism, something I try to share with my realist friends. Also enjoying your post because flatness, illusion, and design within the frame are upmost of my own painterly concerns. You're very welcome, H., it's nice to hear that the post resonated with you.